Well ever since Hunter got his awesome new bike, I have been thinking about my daily run! 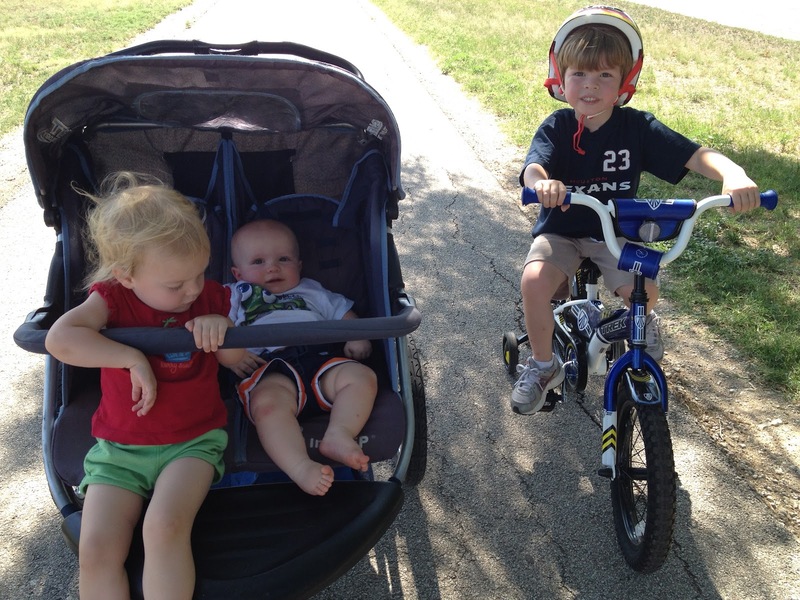 I thought I could take all three kids on my run. Hunter could ride his new bike and the little kids could go in the stroller. Well this morning we did it! I don't know that I will be doing this again anytime soon! Hunter did awesome!!! 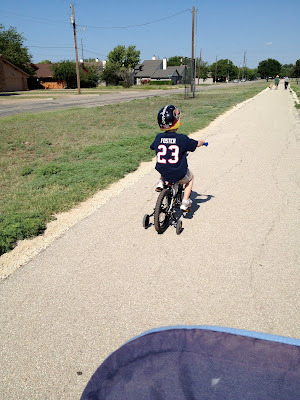 This was his first time riding for that long. He road 1.5 miles and did amazing! I had a lot of fun talking to him and watching him ride. The little kids... not so much! Maggie did pretty good. She only tried to escape once. Archer was tired! He didn't want to be strapped down and he hated the sun in his eyes. There was one time in the run where both little kids were screaming. Nice... I did have to get Archer out and hold him for a little bit. But we survived! I ran (well really jogged) most of the time. I may try it again in a few weeks, maybe in the evening when the sun is a little better. I will also give Archer a snack to snack on next time. Over all this run was CRAZY!! Oh well! :) A few calories where burned, right?? Next time I may just take this little guy! I had fun running beside him as he road! Love that boy!